HIGHLIGHTS: Dillon State Park is located in in Muskingum County, a short distance from Zanesville, Ohio. The area possesses diverse and interesting natural features resulting from the unique properties of the Black Hand Sandstone. Sand, which eroded hundreds of millions of years ago from the mountains farther east, accumulated in a vast delta in the sea covering this region. The hard bedrock eroded to form sheer cliffs and supports a lush, hardwood forest in this area of East Central Ohio. In 1803, Moses Dillon purchased the land bordering the Licking River where the park is located. This industrious early American built and operated a local iron foundry, then creatd the village of Dillon Falls. Moses dammed the Licking River to provide water power for the community, and is probably most noted for his contributions toward the design and construction of the world-famous “Y” bridge in Zanesville. In 1961, construction on Dillon Reservoir was completed for flood control by the U.S. Army Corps of Engineers . Dillon State Park was dedicated a few years later in August 1968. 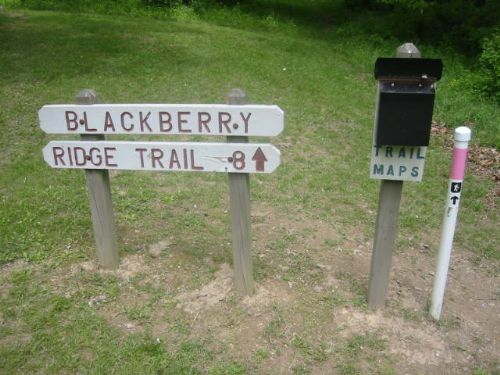 This easy one mile loop starts near Cabins in section A of Dillion State Park. The roundtrip loop hike follows a pink trail in a clockwise direction along a ridge over Dillon Lake with excellent winter views. It then winds back to the starting point straying close to some mountain biking trails on the route.